A dried Lavender wreath can come in all shapes and sizes as well as being made up of different flower materials. Instructions as well as ideas on making a wreath of your own is offered here. Pictures of possible Lavender wreath bases are shown below. To make a Lavender wreath you will first need a form and some Lavender. I prefer working with fresh Lavender but you can use dried Lavender flower bunches too. You can make a simple wire form out of a wire coat hanger or purchase a wreath form from a craft store. Forms, may be wire, Styrofoam or wood. You can even use a eucalyptus one as a base for yours. It all depends on your style and how you want to make your flower wreath. Attach the flower and plant materials with wire and bind them on, or hot glue to a wreath form. For fresh Lavender wreaths binding works the best. When making a dried Lavender wreath choose the method you prefer. My favorite is the Lavender heart wreath. I have seen a beautiful flower wreath using a Styrofoam form where the blossom heads had been stuck into it. If you use fresh flower heads for this you would need to use a toothpick and pre-pierce the form as you insert the stem. Also remember fresh flowers will shrink when dried so pack the flower heads as tightly as possible. The wreath was made using fresh Lavender flower heads and dried rose buds. It was lovely and the fresh materials would eventually dry over time. A large quantity of material may be necessary when making any wreath based on size of the finished piece. There is no end to the creativity you could dream up when making a decorative flower wreath. No two wreaths will ever look a like due to the handmade quality and the skill of the maker. Let me give you a few more creative ideas for making dried wreaths before you go. How about making a wreath form covered just with the tiny flower buds which have been glued on then wrapped with ribbon? To do this you would put glue over the entire form and then dip it or press the tiny buds on. 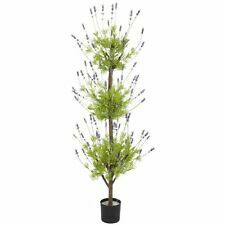 Another could be made using various small bunches of flower heads showcasing the variety of Lavender bloom colors available. You could start with white, then pink, lilac, indigo, dark purple. Think rainbow or a color wheel. Remember the Lavender flowers come in green and yellow too and you could work those in as well. Don't limit yourself to just one type of Lavender either. Make a Lavender wreath that showcases the different varieties and flower shapes such as Spanish Lsvender(Lavandula stoechas) or French Lavender(Lavandula dentata). Add other materials like roses, babies breath or other dried or fresh plant materials. The choice is totally yours as to how to make your Lavender wreath. How about varying the style of the wreaths such as heart shaped, square or even oval. If you plan to hang your flower creation on your front door ask yourself these questions. How much sun and exposure will it get or what about the elements outside? Remember sun fades things and you worked hard on making your wreaths. So think first about your wreaths placement and time invested in it when you hang it. Yes, you can always create another similar to the one you made. Enjoy your Lavender wreath making and send in some pictures! Please send me your flower wreath pictures as I would love to see how creative you are! Click the contact tab at the top and drop me a email. I would love to post some pictures of what you have created so let me know if I have your permission to.